Although fiction may not always be a reliable source on which to base major decisions, sometimes fiction can help us see things more clearly. Good fiction imitates real life. The simplified versions of real-life relationships depicted in fiction sometimes make it easier to recognize interactions of the various relational roles. In his children’s fiction series, The Chronicles of Narnia, C.S. Lewis illustrates several examples of highly toxic relationships. The White Witch in The Lion, the Witch and the Wardrobe, for example, was very abusive toward Edmund as well as all the Narnians, including her most loyal subjects. 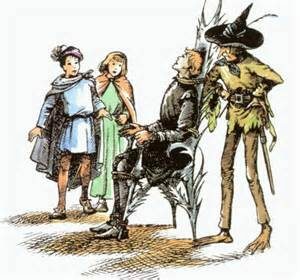 In fact, she was very manipulative and deceitful toward Digory and Polly much earlier, in The Magicians Nephew, where it was revealed she had annihilated every living creature in her own world of Charn… one couldn’t get much more abusive than intentional worldwide annihilation of all life…just to satisfy one’s own pride. Viewing her interactions with others from the perspective of abuser tactics can be somewhat revealing. The relationship between Shift (the ape) and Puzzle (the donkey) in The Last Battle also illustrates some classic abuser tactics. It is quite clear that Shift is in the relationship solely for what he can manipulate Puzzle into doing for him, while Puzzle remains out of a misguided sense of loyalty driven by low self-esteem. Ironically, Shift continually reinforces Puzzle’s low self-esteem, telling him how stupid he is and that he should leave difficult things like thinking to Shift. Puzzle’s low self-esteem prevents him from finding the strength and courage to leave the relationship, yet the relationship continually lowers his self-esteem. For Shift, the constant put-downs to Puzzle not only inflate his own already over-sized ego, but also keep Puzzle enslaved to do his bidding through manipulative tactics of guilt and belittlement. 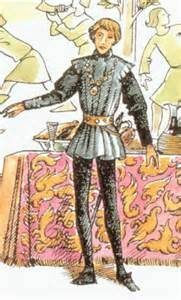 In my latest read through the series, the relationship that most stood out to me as a study of classic abuse was the story of Prince Rilian and the Queen of Underland (aka The Lady of the Green Kirtle, the Green Witch, or the Green Lady) who turned out to be the same green serpent who had killed his mother. Of course we have the obvious maliciousness (obvious to the reader, not obvious to Rilian) of having killed his mother, of holding Rilian captive, and of scheming to use Rilian as a tool to destroy his own home and kill his own family and friends. But let’s take a closer look at some of the interpersonal tactics she used to accomplish these goals. See how quickly Rilian jumped to loyally defend his abuser? When a truthful specific charge of attempted murder is brought against his abuser, Rilian defends her intent. He then recites a whole list of virtues she supposedly possesses…yet falls short of providing any specific examples…because she doesn’t actually display any of them. Do you see how the Green Lady has used a manipulative fog of deceit to enslave Rilian? Underland is a dark and dreary world completely devoid of joy or happiness. Yet the Queen has manipulated Rilian into forgetting how bright and joyful his life was before meeting her. Notice how vague he is on any details. She has convinced him that she has saved him from an evil enchantment and graciously adopted him into her kingdom. Yet he cannot provide any specifics of exactly what was so horrible about his life before Underland…nor of any good in Underland besides the presence of the Green Lady…a questionable ‘blessing’ to say the least. And notice how the Queen has manipulatively turned the truth upside-down for Rilian. She has convinced him he is in his right mind when he is under her spell (believing all her lies) and that he is not in his right mind when he see things clearly (recognizes her lies as lies). She has convinced him that when he is in his right mind (recognizing her lies) he is a danger to his friends…when, in fact, she is making very specific plans to manipulate him into leading a charge against his true friends, the Narnians. In fact, his true friends…those friends from his former life…the life he led before meeting the witch…are his ONLY friends. One must wonder what friends she was even talking about him being a danger to, as she has so isolated him from all associates other than herself that he no longer has any friends. What? Wait a minute! Who turns into a serpent? Certainly not Prince Rilian! No, it is the Queen herself who turns into a deadly serpent…the same serpent who killed his mother. Yet she has convinced Rilian he is the one who transforms into a monster. This fog of manipulative deception is so typical of abuse! Some of you who have experienced abuse will recognize it. The bitter clinging to vague imagined slights of friends from life before the abuser…the imagined virtues of the abuser based solely on their statements of intent that never actually come through in reality…the upside-down world of confusing one’s true identity with the abuser’s character and the abuser’s character as one’s true identity…it is a fog of deception much as Lewis has portrayed here. This common abusive tactic, called gas-lighting, uses manipulative deceit to lead the abuse target to doubt their own senses, suspect their own memories, and question even their own sanity. The goal is to make the target completely dependent on the abuser for their perception of reality. Have you ever wondered why an abuse victim stays? This is often part of the reason. The fog of deception is not easily penetrated. Later, with the help of his new friends, Prince Rilian is able to pierce the fog of deceit and clearly see the witch’s enslavement for what it was. However, the witch manages to once again draw him into her web of lies, along with his new friends. Through the use of illogical arguments, she soon has all four accepting her lies and falling under her fog of deception. She asks questions as though she is interested in understanding…yet all she really wants is to convince them to abandon truth for her lies. The more they try to convince her of the truth, the more deeply they succumb to her web of deceit. Before long, she has them believing there is no such thing as a sun, moon, stars, trees, or green grass…that nothing exists outside the dark dismal world she rules in Underland. Puddleglum wisely stopped trying to convince the witch. He stopped debating with her. Debating was playing right into her game plan. She had no interest in understanding their perspective, nor of seeing the truth, nor even of using logical arguments in debate. In fact, she already knew what they said was true and what she said was a lie…she was not in need of convincing nor open to being convinced. But as long as she could draw them into a debate, she could continue to spin her web of lies, making them question their own sanity, their own memories, and the testimony of their own eyes. Puddleglum chose to stop debating and to simply cling to what truth he could see. 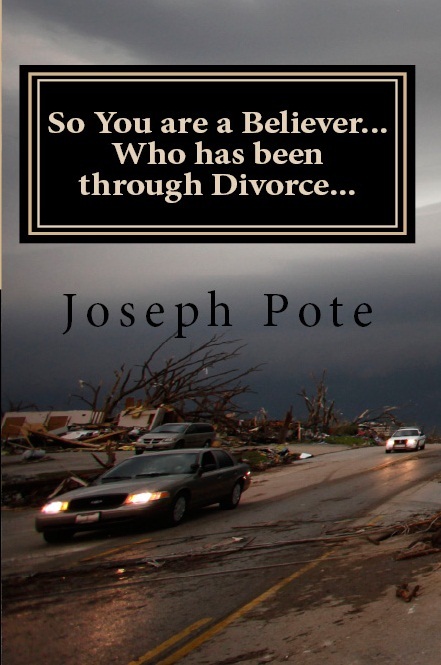 He took a stand and stated the truth he could see at the moment…in a manner that shut off all argument or debate. Trying to convince the witch was futile and completely unnecessary. It is important to confront lies with the truth. It is futile to try to convince a liar they are lying. They already know they’re lying…and have already chosen to continue lying. Debating just gives them more opportunity to spin their lies. So stop debating. Stand firm in the truth and refuse to debate. This is the best escape from the manipulative fog of deceit. BUT…if you are in an abusive relationship…make sure you have a safety plan…ask for help from trusted friends…or make new friends who can be trusted. When Puddleglum exposed the witch’s lies, she finally dropped all pretense and transformed into a deadly serpent, trying to kill them all. The same often happens when an abuser is confronted by a victim escaping their control…they become more dangerous than ever. Cling to the truth. Take a stand. Have a safety plan. Ask for help. Trust God…because He is trustworthy. In the story of Prince Rilian, Aslan sent friends to help him in his hour of need. 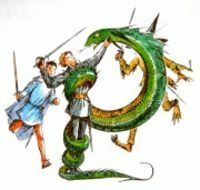 The friends helped free him from the Green Lady’s deceptive enslavement, and defended him when she tried to kill him. If you are trapped in an abusive relationship, ask God to help you seek out friends who can help. One place to start may be by contacting a shelter near you. Any abused woman located in central Arkansas can contact The Dorcas House at (501) 374-4022 for help and shelter for herself and her children.